Election Time in Poland! Who will Putin vote for? Separate WWII commemoration services have been initiated by the current president. The rearmament programme and decisions on bidders have been announced by President Komorowski. Despite “strenuous efforts” we could not have it any other way, considering the military conflict between Russia and Ukraine, the shooting down of the Malaysian airliner, or the murder of Boris Nemtsov nearby Kremlin. Yes, Vladimir Putin’s favourite candidate for the president of Poland (however chilling that may sound) was, is and will always be Bronisław Komorowski, who himself has no value, but whose team remains invaluable to the Russian “hawks” since it guarantees the Russian “assets” in Poland to stay untouchable. 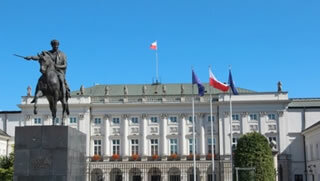 The symbol of those assets is first and foremost the WSI (Polish Military Information Services), which was formally disbanded by the decision of the Polish Parliament (Sejm) but for Komorowski that decision was a “disgraceful crime.” Amongst other assets are: unverified commanding staff in the Polish Army and the generations of faithful and untouchable members of the Polish judiciary system and media. Therefore, the election must not focus on subjects such as: the Gazprom contract, beneficial to one party only, the sluggish construction of Świnoujście LN Gas Terminal, corruption in the Polish justice system or the Polish prosecution’s leniency towards the government. Komorowski, a nominee for president of the condominium, will not touch anything that might threaten the interest of the party interested in the subjection of Poland: that is Germany. He will not react “hysterically” to slanders about the complicity of Poland in the WWII genocide. On the contrary, he will sell the state-owed forests to satisfy claims, resulting from crimes once committed by German forces in Germany-occupied Poland. Is that the price to pay for Poland’s security? There is one more good reason for Putin to support the current president. In the coming weeks, he will be able to arrange a series of provocations in order for the Ukrainian conflict to escalate tentions in Poland. In my imagination, I can just picture Komorowski, Kopacz and Polish media alarming against the opposition party PiS (the Law and Justice Party of Late President Lech Kaczynski), a party which undoubtedly would lead us to war with Russia. This tactic has been used many times before. However, this time it might just generate a result opposite to the one expected. There is no doubt that Poland’s security has been weakened during the current president’s tenure, whilst the present subordination towards the neighbouring states leads to the loss of sovereignty and the war reaching our borders.